Read it or Skip It? Circe, by Madeline Miller, came out early last year, and I’ve been keen to find time for it, so it seemed like a good book to kick off the spring season. It’s a re-telling the story of Circe, a character originated circa 8th century B.C. by Homer. In Homer’s in The Odyssey, Odysseus encounters her on the island of Aeaea where she is villainously doling out dangerous potions and turning men into pigs. While in her original incarnation she’s mostly an obstacle to be overcome, in Miller’s reinvented tale, she’s given a new life, as well as a meaningful and imaginative story deeply rooted in a myriad of mythological tales. For the Detailed Plot Summary, click here or scroll all the way down. Circe is the daughter of Helios, God of the Sun, and Perse, an Oceanid nymph. Despite her divinity, she is less beautiful and lacks the skills of her siblings, so she is largely shunned and ridiculed among the godly. When she falls in love with a mortal who, of course, is fated to age and die, she is desperate enough to experiment with a different and illicit type of power — potions and witchcraft, and with it she discovers her own ability to bend the world to her will. A while back, I took a trip to Greece and visited one of the locations that appears briefly in the book, the remains of Minos’s Palace at Knossos in Crete. It was about a hour out from where we were staying, so we had to rent a car, and it was a whole mess, but I desperately wanted to see it. I’ve come across other references to this site then, but Circe was the first book that ever made me reminisce about it. 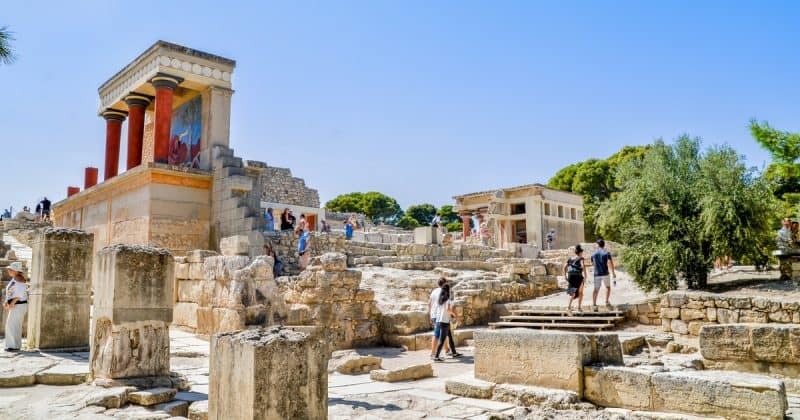 Reading Circe, I could imagine that crumbling Minoan archaeological site, thousands upon thousands of years old, as a living, breathing palace, gleaming with splendor and marveling that I’d once walked those walkways as well. Miller’s mythological retelling is so dazzlingly alive. She uses Circe’s story to bring in a whole host of other mythologies, ranging from the Titanomachy (“battle of the Titans”) to the Gift of Fire, various other parts of the Odyssey and so on. The events of these stories all overlap, one washing over the next, intertwining in a delightful and inventive manner. Under Miller’s imaginative gaze, these classic stories are endowed with a newfound energy. Fleshed-out and lively, it’s a pleasure to read, especially if you’re someone who loves mythological tales. The most difficult part of reading Circe for me was that it took forever because whenever a mention of any character came up, I was always tempted to look them up on Wikipedia to see what parts of their story originate from where. This inevitably led me down deep, and I mean deep, rabbit holes of endless Wikipedia entries and other sources filled with mythological esoterica. (But honestly, I’d consider that a feature, not a bug, when it comes to reading). By the second half of the book, Circe has been alive for over a thousand years. She becomes more reflective about her experiences during various interludes, and certainly when Circe’s story takes a darker turn. At those junctions, Miller is thoughtful and introspective. In the book’s more somber moments, Miller explores Circe’s loneliness, alienation, and how her perceptions may have been warped by her experiences or misunderstandings. Through the relationship of the gods, Titans, Olympians, lesser gods, mortals and so forth, the book contemplates the meaning of having power, how power is derived and how power effects how people relate to each other. Furthermore, using a range of classic Greek Myths to tell a story provides the perfect foundation and a wide berth to delve into fundamental questions about morals and goodness and pragmatism and ambition and balancing it all with the need to survive and protect yourself. I loved what a complete character Circe is. She is a complex, imperfect and is consistently drawn in a way that grounds her in reality, despite her divine origins. I loved this book. I loved this book so much, it actually surprises me how strongly I feel about it. If you like mythology, Circe is a must read, no caveats. It is such a vivid and wonderful story that brings together so many bits and pieces of Greek mythology and somehow turns them into a cohesive book that is well worth your time. It is all at once thoughtful and entertaining and elegantly written. I was delighted by it. If you aren’t as into mythology, I still think the story is very worthwhile, though you may have to exercise a bit more patience as you get grounded in all the characters and their stories. I’d really encourage you to give it a shot though if you’re looking for an entertaining, yet meaningful and complex story. Circe won me over about 20 pages in, and it only got better from there. It’s honestly been quite a few years since I’ve found a book I loved as much as this one, so my feeling can be summed up as follows: 1) I’m sad it’s over, 2) I can’t believe I waited so long to read this, and 3) I need to go buy a copy of Madeline Miller’s previous novel, The Song of Achilles. Have you read this and what did you think? See Circe on Amazon. Note that these headers (The Beginning, Glaucos, Aiaia, etc.) are not in the book. Chapters 1 - 3. Circe is the daughter of Helios (a Titan and Sun God) and Perse (Oceanid Naiad/Water Nymph). She is a god, but she is less beautiful and lacks the powers of her siblings, Perses, Pasiphaë, and Aeëtes. Perses and Pasiphaë are unkind to her. Aeëtes is relatively nicer and he finds a deserted shore where they play together, but he eventually leaves when Helios grants him a kingdom (Colchis). Pasiphaë is married off to Minos (demigod) of Knossos and Perses goes off to Persia. Drama roils the gods when Prometheus (a Titan) is punished for giving mortals the gift of Fire. The other Titans are angry that Zeus is punishing him, they feel he is sending them a message. They are itching for war. Chapter 4-5. Circe visits her and Aeëtes's shore and finds Glaucos, a mortal and a fisherman, who is captivated by her. She falls in love with him. She pleads with Tethys (Titan of Fresh Water) to bless him so he can fish without worry. Circe's desperation to make Glaucos immortal leads to her curiosity about Pharmaka -- herbs with powers, grown where the blood of gods have fallen -- though it is illicit to speak of them. Through a makeshift potion, she transforms Glaucos into a sea-god. Others believe it is the work of the Fates, and Glaucos the God is welcomed and adored. He falls for the beautiful but malicious Scylla (nymph) and plans to marry her. Circe, heartbroken, turns to her herbs to transform Scylla into a sea monster, but it fails to win back Glaucos. Chapters 6-8. After Circe admits her use of witchcraft, it's soon clear all her siblings also possess these abilities, though only Circe is deemed to have acted improperly. Helios and Zeus decide she is to be exiled. 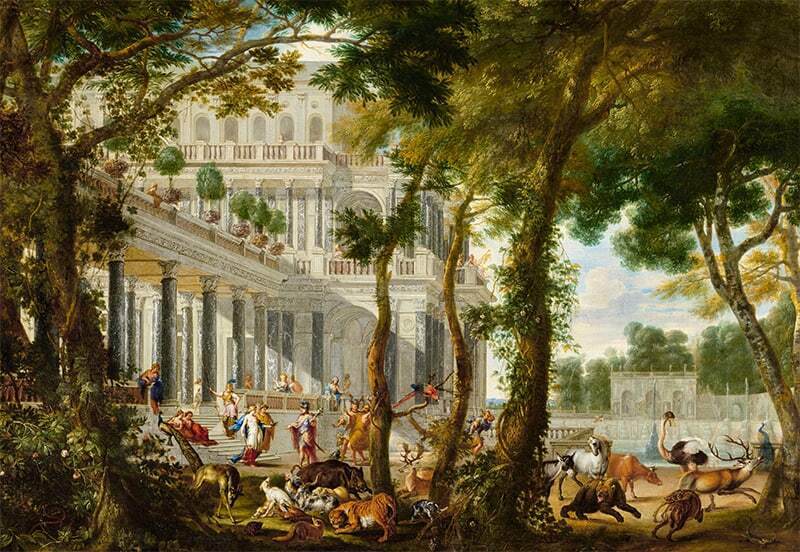 Circe is left on an island (Aiaia) with a palace. Helios chooses an island that was once bathed in the blood of a Titan. She learns to use herbs, and hone her abilities in transformation and illusions. She summons a lion familar. Hermes comes to visit and they become lovers. Chapters 9-12. A ship carrying Daedalus, a famed mortal craftsman, appears. He tells her Pasiphaë requests her help. Circe agrees. On the way, Circe uses her magic so they can get past the straits where Scylla the monster resides. In Knossos, Pasiphaë gives birth to the Minotaur. Circe uses a spell to manage its hunger, but it still must feast on human flesh each harvest. Daedalus builds its labyrinthine cage. Daedalus is bound to Knossos because they have his son, Icarus. Circe meets Pasiphaë's daughter Ariadne who is hopeful and kind. Circe bonds with Daedalus, and when she leaves he gives her a gift of a magnificent loom. Circe learns to weave. Later she hears that Daedalus built wings to help him and his son escape Knossos, but Icarus flew too close to the son and died. Daedalus passes away from old age. Hermes reports that Ariadne is dead, which upsets Circe. Ariadne had to flee after aiding Theseus in slaying the Minotaur. She was then killed by Artemis (Olympian Goddess) for unclear reasons. Chapters 13-14. The mortal daughter of Aeëtes (Medea) and Jason arrive at Aiaia to ask Circe (the Witch of Aiaia) to cleanse them. Medea murdered her own brother and used magic to help Jason acquire a golden fleece, which he needs in order to claim his place as the King of Iolcos. Medea describes how inhumane Aeëtes has become, killing mortals for sport. Circe warns Medea that Jason's feeling for Medea will wane now that she has outlived her usefulness, like Glaucos's did for her. Medea angrily departs. Aeëtes arrives shortly in pursuit but also departs angrily when he learns Circe has let her go. Next, Alke, the daughter of a lesser river lord, has been sent to serve Circe for a year as punishment. Soon others latch on to the idea and send other daughters as punishment. Circe dislikes having them around. Circe and Hermes tire of each other, and her lion passes away. One day, sailors shows up. She generously feeds them. When they realize she is alone, the captain attacks her, and she turns them into pigs. Chapters 15-17. When others hear of the island of nymphs, more sailors appear and she turns them as well, unless she believes them to be honest men, but eventually she simply knows that they are not. A ship of men arrive and she turns them. Their captain Odsseus comes looking. Circe finds him disarming and witty. She realizes he has the herb Moly which prevents her from harming him, and that Hermes must have given it to him. For fun, she sleeps with him, and makes an oath not to harm him. After, they talk and she changes his men back. He asks to stay for a month to mend their ship, which turns into a season, and then a year. Odysseus recounts the war (Trojan War) and their travels (Cyclops, etc.). He tells her about how he angered Athena. Circe grows closer to him. She knows he must eventually return to his wife and to Ithaca, but she yearns for him to stay. Apollo appears briefly to deliver to her a prophesy about Odysseus -- it is a vision of him in Ithaca, dashing her hopes. She also sees that he must visit Teiresias, a prophet in the house of the dead. Odysseus visits him. Circe tells him more about what faces on the journey home (Sirens, Scylla, etc.) and they bid farewell. Chapters 18-20. Circe is pregnant. Weakened, she sends everyone away and casts a spell to prevent others from visiting. She has a son, Telegonus. She fears for him because he is mortal. One night, Athena appears. She wants the child dead and even offers her eternal blessings in exchange. Circe refuses, and realizes that the Fates have forbidden Athena from directly killing him. Before Athena leaves she tells Circe she will regret it if she does not let the child die. Circe brews a powerful potion to compel the island to protect Telegonus and keep Athena away. The boy grows up to be curious and idealistic. Hermes secretly helps him to builds a boat and he wishes to sail to Ithaca to visit his father. Circe is certain Athena will kill him en route and initially forbids it, but realizes it is futile and helps him to prepare and gather protections instead. Circe pays a visit to Trygon, a sea god, and asks to fight him for his tail which has a deadly poison. He tells her he'll give it to her if she will suffer its poison for the rest of her life. She agrees. He tells her she can have it and does not demand the price. She must return it to him when she is done. She uses this to form a weapon for Telegonus. Telegonus departs for Ithaca. Chapters 21-24. Very quickly, Telegonus returns. Odysseus is dead. He tells Circe that Odysseus misunderstood his intentions and didn't give him a chance to tell him who he was. Odysseus attacked him, grabbing his spear and scratching himself in the process. Circe realizes this is why Athena wanted Telegonus dead. Odysseus had angered her and she had wanted him to grovel, but he had always been as her favorite. Telemachus (Odysseus's other son) and Penelope (Odysseus's wife) are with him. Circe is suspicious of their presence. Eventually Penelope tells Circe the truth -- that she was worried Athena would come to claim her son (now that Odysseus is gone) and hoped Circe, a witch and god, could protect them here on Aiaia. They are happy together for a while, but Hermes brings word that Athena beckons and demands that Circe remove her protective spells. She lies and says she needs three days, so Penelope and Telemachus have time to discuss. Athena inevitably appears, beckoning Telemachus to be whisked off to start an empire in the west. Telemachus, who has seen the how power and war effected his father, has no desire for glory and power and refuses. Athena turns to Telegonus, who is eager for adventure and accepts. Chapters 25. With Telegonus gone, Circe calls for her father. She demands he talk to Zeus and release her from her exile. She threatens to tell Zeus the Titans' secrets and start a war. They return to Aiaia, and Circe finds that Penelope has taken what she has taught her about herbs to delve more into witchcraft. She agrees to take up the mantle of the Witch of Aiaia. Circe uses the moly to make a potion to bring forth her true self. She has a vision of herself becoming mortal and living a life and growing old together with Telemachus. She drinks the potion. If this summary was useful to you, please consider supporting this blog by checking out this book via the Amazon Affiliate link here. It takes one second and really does help to offset the costs (hosting, design software, licensing fonts and graphics) of running this site. Thank you! Been meaning to read this. Do you think reading it in electronic format is OK? Some books lose something when read on a device. Thanks for reminding me about this! I’ve added both Miller books to my TBR. We’re great fans of Greek mythology around here: I was hooked during my childhood, when the marionette puppeteers who used to make the rounds of the schools put on a “Golden Fleece” show; and my kids grew up watching the 1950s “Jason and the Argonauts” movie, when it was finally released on video, just as I had been raised on it, back when it was released to broadcast TV (I still love those ancient special effects). Oh, I’m excited on your behalf, I think you’re going to love it! I honestly don’t understand how anyone can NOT love mythology, it’s so fascinating and fun and dramatic. That’s so awesome they did a Golden Fleece show, it sounds like that would be so much fun! Thanks for your thoughts and happy happy reading! Hope you’re having a great weekend! Oooh! I’ve been hearing nothing but good things about this book! It’s waiting on my shelf … I think it’ll make a good July read? Yes, do it! I actually bought this book back in September or somewhere around there and I still can’t believe I let it sit there for so long, haha. Hope you love it! I adored Circe, and The Song of Achilles! This has been on my TBR list for awhile. I hope I can get to it soon. Thanks for your thoughts. So many books, so little time, such a familiar feelings, haha. This one is really good though. Hope you love it if you get a chance to read it! Yeah this book is amazing. Right?! The best part about book blogging is getting to chat with others about how awesome a book is when you find one you love… thanks for dropping by! So glad you read this book!!! Honestly one of our favorites!!! You have to read A Song of Achilles, because like Circe it draws you into Ancient Greece like nothing before! When you get the chance to read, come check our review and tell us your thoughts as well!! Thanks for dropping by! I’ll give your review a read later today, thanks for the heads up! Glad to see you enjoyed this book so much! I listened to the audio last summer and found the story lively – it moves at such an absorbing pace, from start to finish. Yeah, I was surprised how evenly paced it was considering how much of the book hinges on understanding her internal thought processes. I feel like it’s hard to write that stuff in a way that doesn’t make the book drag. I think it worked well in Circe because she does a fantastic job of “showing” you how her perspective on things is shaped, etc. instead of just doing a bunch of internal monologues. Thanks for dropping by! Thank you for the kind comment! Glad to connect with people who loved this book as well! :) Cheers! This book was fantastic. Appreciate the review. Thanks for dropping by and thanks for reading! Thanks for your review, I’ve been meaning to read this book and whilst I’m not a huge fan of her previous book, I have to admit she has a beautiful writing and a melancholy that I like. Can’t wait to read this one. Oh, I’m sad to hear you didn’t like A Song of Achilles. I’m really curious about it — I haven’t read it yet so unfortunately I have no insight to provide on a comparison between the two, but I hope you do like Circe, and thanks for reading the review! Oh it’s not that I didn’t like it, it’s just that the first half of the book was a nit difficult for me. I didn’t quite like how the story was told, but the second half was amazing. I cried by the time it ends. Anw, I love reading your reviews, it’s always well written. This book does deserve a glowing review! Loved it too! I honestly can’t believe I didn’t read it sooner! Thanks for dropping by! I wrote about Circe in my dissertation so it seems incredible I still haven’t read it!! Fingers crossed I get round to it soon!! I bet you’ll love it! Thanks for reading! Oh that’s awesome, I’m jealous I would’ve loved to hear that. I’m so glad other people loved this book too! :) Thanks for dropping by! Nicely written review. I’ll think I’ll read the book. Thank you! Hope you like it if you get a chance to read it!